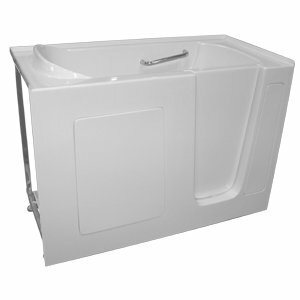 If you’re looking for a mid-sized accessible bath option, the HD 2653 walk in tubs with hydrotherapy may be a great choice for you. This compact but spacious tub can easily fit into many common bathroom sizes and shapes. If you’re limited on space, yet still want a decent amount of room internally, this 26” x 53” walk in bath is very versatile. It can come with all of the bells and whistles you could want! You can get aromatherapy, multi light chromatherapy mood lighting, dual hydrotherapy massage, internal safety grab bar, 5 piece polished chrome faucet, hand held shower wand and Sure-LOCK™ Tub Door Latch System. Buying a new walk in bathtub can be a little confusing sometimes. If you have shopped around, you most likely have noticed a tremendous difference in price from one company to the next. Oftentimes the price is no indication of quality at all. Some of the most expensive brands actually offer some of the worst elderly tubs. If you want to know where to buy walk in tubs, look no further. We are a family owned and operated business that was founded for you. 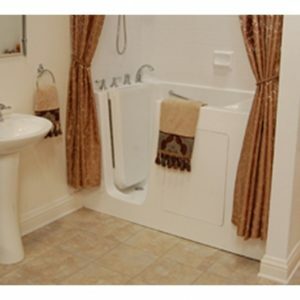 We truly strive to offer the highest quality handicapped bathing products, at the lowest prices nationally. Give us a call to get a no obligation consultation and price quote. We want to help you find the best options possible for yourself and your loved ones. Who says you have to pay for luxury? Our premium line of luxury walk in tubs will be sure to impress you. And they oftentimes for thousands less than the competition. Not only do they come with industry leading lifetime warranties, but they also boast several third party certifications for their quality standards. We carry multiple sizes for you to choose from. Extra small, small, medium, large and even extra-large oversized walk in bathtubs. Get yours with all of the options you want and need. You deserve it!